Saraswati's works offer a window from which we can take an imaginative leap to the free-spirited world of our childhood. The pieces playfully pique interest through their quirky presence and subtle details, capturing the intimacy of her process, style .while harnessing her lively energy and in style. Her whimsical Klee -inspired pieces are fantastic, childlike and witty . She achieves stunning results with her experimental merging of form and color, mixing oxides, glazes, and underglazes like an alchemist and using materials ranging from Paperclay to Stoneware to Porcelain with metal, wood, and glass. Starting off young, under the tutelage of her ceramicist mother, Anna in Russia, Renata would spend time watching her stepfather, a still-life photographer, create still life compositions in every corner of the house, using ceramics to substitute what he couldn't find in objects. Much like the clearly apparent influence of Cubist still lifes on Klee , The Ark, and the Going Triangular series evidence Saraswati's drive for precision of placement, the use of the visual triangle ,of elements of varying size, colour and textures and a clever use of negative space , all orchestrated to guide the eye. Sculpting miniature pieces rich in color, with immaculate finishes and beautiful contrast in textures, her two mosaic works, The Birth of Lifeand Second Day of Creation carry a hint of Abstract Expressionism, where she combines painting with acrylic or oil on porcelain pieces. The process for her is extremely playful and reminiscent of putting together a jigsaw puzzle until the perfect fit falls in place. In her art installations, Those (Set of 4), Hometown (set of 10), All Right and Pumpkin Patch (Set of 10) she explores shape and repetition to create a whole that is much larger than the sum of its parts, employing design, pattern, and color in a Miroesque manner. Born in Russia, into a family that lived and breathed ceramics, Saraswati began to work with clay at the age of 12 and has been in love with it ever since. She graduated from Pedagogical University as a Russian Language and Literature teacher and worked as a TV journalist before she moved to Auroville in 2004 and became fully dedicated to ceramics. She is the co-founder of the White Peacock Clay Club at Auroville with her mother Anna who works at intricate paintings on porcelain and is now joined by her daughter, Masha, who sculpts characters from Russian fairy tales using ceramic. 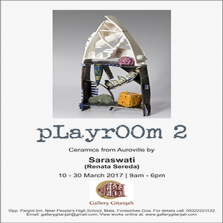 Saraswati's works reflect a desire to not just use ceramic art as a metaphor for various aspects of the human experience but also to transport us to a transcendental space where we begin to see that the material world is only one among many realities open to human awareness.